Lean Innovations Taken to New Heights | Grunau Company, Inc.
Creative thinking and developing a better way to perform our tasks are basic principles of Lean construction. Grunau encourages employees daily to think of Lean innovations. When the HVAC team started talking about how to lift air handling units on to each of the over 30 floors of a new skyscraper being built, their minds went into creative mode. The project team subsequently worked together to develop a material lifting platform. Grunau Metals designed and fabricated the piece. The foremen did a dry-run test in September to work out any kinks before actual use. 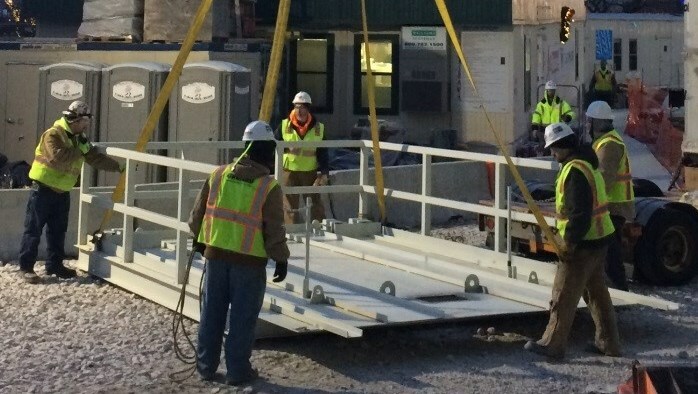 The lifting platform was then put into action on the jobsite in December. The platform is designed and engineered specifically for the dual path air handling units. It has a track for the wheels, as well as load securement. The platform is flown up to the concrete floor and secured to the building using come-a-longs. The dual path air handling units are then pulled off of the platform using an electronic winch and set into place. A couple tweaks were made after the first uses so additional improvements may be made as we continue to utilize this innovation. It was a successful total team effort. The platform will be used many times during the months ahead as the skyscraper continues to build upward.